Fried pizzas and obscure heirloom vegetables star at A16, Rockridge's newest fancy Italian hotspot. A16 is probably best known for its Neopolitan-style wood-fired pizzas. A16, the Oakland outpost of one of San Francisco's most popular upscale Italian restaurants, serves one pizza that's fried, another that's shaped like a tennis racket, and a handful of pasta varieties you've probably never heard of. While the restaurant's paradigm (Southern Italian cuisine prepared with high-quality local ingredients) is familiar, and its menu sticks to dishes traditional to Italy's Campania and Puglia regions, many of these dishes can't be found in other restaurants in the East Bay. So it is that A16 is one of a handful of new dining establishments helping to put Oakland's toney Rockridge neighborhood back into the limelight, culinarily speaking. On any given night, you'll find the dining room packed with well-dressed patrons (though, in true Bay Area style, you can always spy one or two in flip-flops and cargo shorts). The prices are in line with what you might expect for Rockridge, which is to say, they aren't low. But if you're willing to splurge, the restaurant happens to serve some of the most exciting Italian food you'll find in the East Bay right now. Owners Shelley Lindgren and Victoria Libin named their original San Francisco restaurant after an Italian freeway that runs from the Tyrrhenian Sea to the Adriatic — a wide swath of Italy whose recipes inspire the restaurant's cooking. The Oakland location has the same regional focus, but chef Rocky Maselli has created a menu that's all his own. Here, for instance, there's a stronger emphasis on seafood, including a daily selection of crudo (raw seafood dishes) and, occasionally, a whole-fish entrée. One of my most memorable bites was a bucatini dish: thick pasta strands coated in a golden-yellow, intensely briny sea urchin sauce. I loved the boldness of the ocean flavors, though I'd recommend getting a small portion to share rather than the full entrée — the dish is too intense to enjoy in large quantities. The somewhat offbeat selection of pasta dishes is one of A16's hallmarks. Every night there are four on the menu — two dried pastas and two fresh ones — and over the course of two visits, there wasn't a red sauce or a spaghetti in the bunch. Orecchiette, for instance, is fairly commonplace, but you won't find many Bay Area restaurants making it fresh — each individual "ear" shaped by hand. Maselli serves a variation on the classic combination of orecchiette, sausage, and broccoli rabe, but with crispy lamb sausage, crushed Senise peppers (which added a fruity, bittersweet dimension), and a surprisingly mild sauce made with puréed broccoli rabe. Less successful, though, was a dish featuring paccheri — fat, hollow tubes of pasta that were slightly hard, like they'd been taken out of the water about thirty seconds too soon. For a dish that included cherry tomatoes, squash blossoms, ricotta salata, and high-quality olive oil, the flavors were strangely muted. A16 is probably best known for its Neopolitan-style wood-fired pizzas, which arrive gorgeously blistered, ready to be cut up with the sleek, dangerous-looking scissors your server leaves behind. 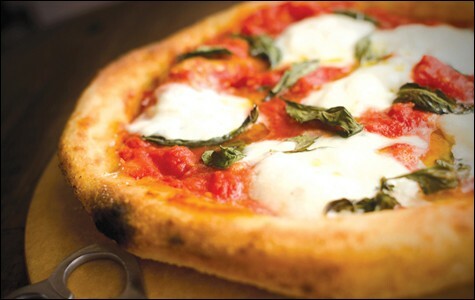 With the pizzas, too, Maselli branches out from the usual suspects. I couldn't resist ordering the "montanara Rockridge," his take on a kind of Italian fried pizza that's traditional in Naples. I'm not aware of another restaurant in the Bay Area serving the dish, which is a shame because it's delicious. Each round of dough gets lightly fried before it's topped with a smoky tomato sauce, burrata, and basil, then finished in the oven. You end up with a cross between frybread and a standard margherita pie: crunchy and chewy, redolent of olive oil, and utterly addictive, especially combined with that smoky sauce. For a change of pace, slather on a bit of A16's spicy house-made chili oil, which is addictive in its own right and turns out to be the simplest thing: olive oil and red chili flakes whizzed together in the blender for a minute. Meanwhile, the racket-shaped rachetta initially struck me as a bit of modernist whimsy. The inspiration for this dish also came straight from Naples. A16's version is topped with green olives, basil, fresh mozzarella, and tomato sauce, with a calzone-like crust handle that's stuffed with fresh ricotta cheese. It was a handsome pie, cool-looking and tasty, but the execution was sloppy: Inside the "handle," the dough was practically raw. Chalk it up as a fluke, but it's hard to be forgiving when you're shelling out twenty dollars for pizza. Indeed, one thing the new A16 has retained from the San Francisco original is its big city prices. No single dish is priced outrageously, but the portions aren't large, and it's easy to run up a big tab if you sample a variety of dishes. Even ordering conservatively (say, skipping dessert and eschewing the restaurant's much-lauded wine list), it's tough for a party of two to get out for less than $90 after tax and tip. For most of Oakland, that's a special occasion dinner, not a meal for the everyday. The most expensive items are the secondi, or main courses — dishes like rabbit meatballs (which were crunchy and fennel-heavy, like Italian sausage) or roast leg of lamb. But these were a decent value, the cost mitigated by the fact that the entrée price included a choice of contorno, or vegetable side dishes, which were uniformly excellent. Try the roasted fennel (charred nicely, then dusted with shavings of cured fish roe) or the fried potatoes, which were freakishly light and bursting with a natural, earthy sweetness. I won't presume to tell you if you'll find dinner at A16 to be worth the price tag, but if you appreciate warm, attentive service — and such niceties as multiple rounds of silverware-changing and plate-clearing — you'll feel well-cared-for here. In any case, if you're really splurging, don't pass up on the nine-dollar honey panna cotta, which was delicate and quivery and topped, brilliantly, with roasted peaches and a hazelnut "crumble," like broken-up pieces of biscotti. It might be the best you've ever had.